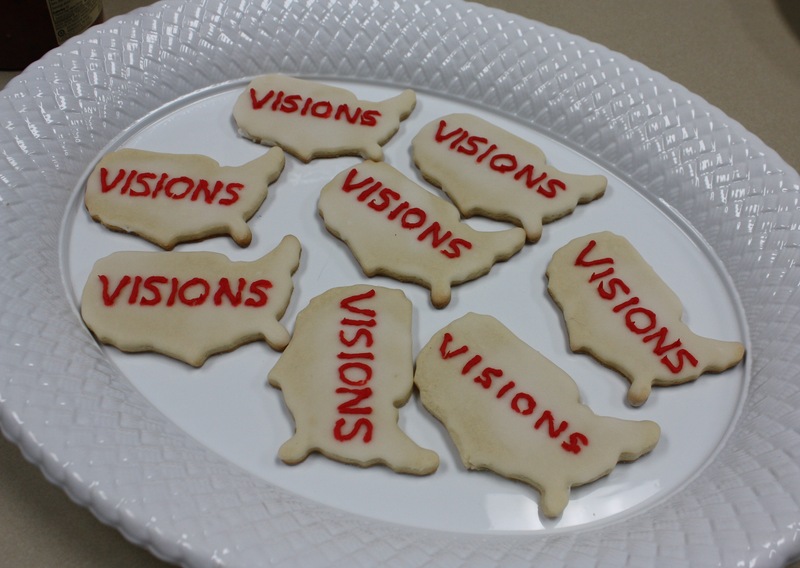 Six months ago, when I still wasn’t sure the VISIONS Across America project would fly, I went to a going-out-of-business sale at a local candy store. 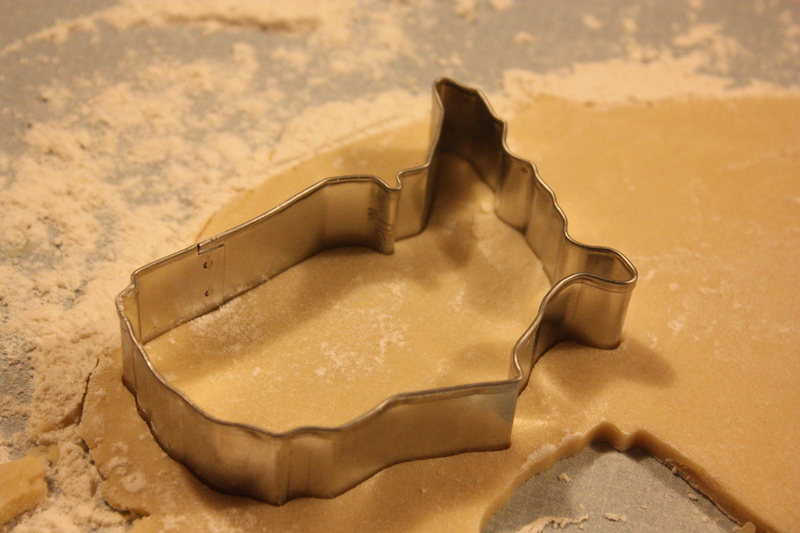 I was looking for chocolate molds, but what caught my eye was a cookie cutter in the shape of the United States of America. I bought it for 75 cents and considered it a good-luck omen for the VISIONS project. It’s been in a drawer in my kitchen, waiting for its day to shine. That day was yesterday. We had a VISIONS Across America launch party for the Alumni Association staff — to show off our website and thank everyone for all their hard work (so far) on the project. I baked these sugar cookies and hung maps all over the room and made little business cards. 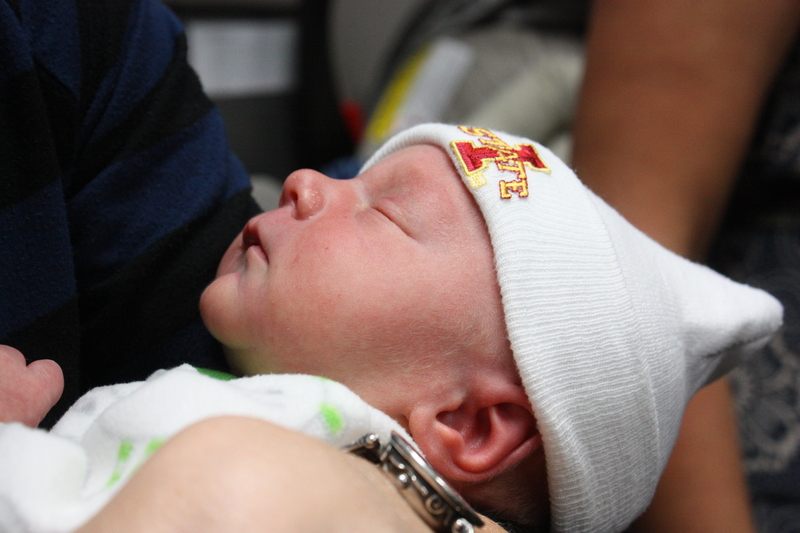 But the real hits of the party were Kate and her new little Cyclone, C.J. Bruns. C.J. was born on Sept. 5 just hours after Kate finished her part of the VISIONS Across America website. I was so pleased that they could come to the launch party! It just seemed appropriate somehow. C.J. slept through the whole thing, so we were able to play Pass the Baby from one person to the next, and he never stirred. I called it Baby’s First Launch Party. Isn’t he adorable?